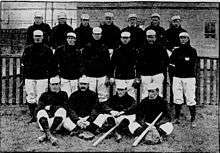 The 1901 Brooklyn Superbas lost several players to the newly official major league, the American League, and fell to third place. February 1901: Gene DeMontreville was purchased from the Superbas by the Boston Beaneaters. June 17, 1901: Cozy Dolan was purchased by the Superbas from the Chicago Orphans. June 19, 1901: Lefty Davis was released by the Superbas. June 20, 1901: Hughie Jennings was purchased from the Superbas by the Philadelphia Phillies.